Power BI is one of the best tools to deliver insights with simple and interactive visualization. To view dashboards and reports from Power BI on web pages in a portal, you must enable Power BI visualization from the Portal Admin Center. You can also embed dashboards and reports created in the new workspace of Power BI by enabling the Power BI Embedded service integration. You must have an appropriate Power BI license. To use Power BI Embedded service, you must have an appropriate Power BI Embedded license. For more information, see [Licensing](For licensing: https://docs.microsoft.com/en-us/power-bi/developer/embedded-faq#licensing). Enabling Power BI visualization allows you to embed dashboards and reports on web pages in a portal by using the powerbi Liquid tag. Select the name of the portal for which you want enable Power BI visualization, and then select Manage. Go to Set up Power BI integration > Enable Power BI visualization. Select Enable in the confirmation message. While Power BI visualization is being enabled, the portal restarts and will be unavailable for a few minutes. A message appears when Power BI visualization is enabled. 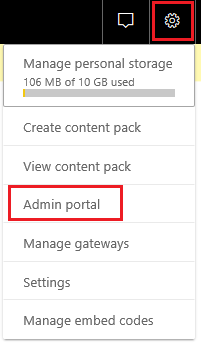 Select the name of the portal for which you want disable Power BI visualization, and then select Manage. Go to Set up Power BI integration > Disable Power BI visualization. Select Disable in the confirmation message. While Power BI visualization is being disabled, the portal restarts and will be unavailable for a few minutes. A message appears when Power BI visualization is disabled. Enabling the Power BI Embedded service allows you to embed dashboards and reports created in the new workspace of Power BI. The dashboards and reports are embedded on webpages in a portal by using the powerbi Liquid tag. Prerequisites: Before enabling the Power BI Embedded service, ensure that you have created your dashboards and reports in the new workspace in Power BI. After creating the workspace, provide admin access to the global administrator so the workspaces are displayed in the Portal Admin Center. For more information on creating new workspaces and adding access to them, see Create the new workspaces (preview) in Power BI. Power BI Embedded service limitations: For information on limitations, see Considerations and limitations. Ensure that Power BI visualization is enabled for the powerbi Liquid tag to work. Go to the Dynamics 365 Administration Center page, and select the Applications tab. 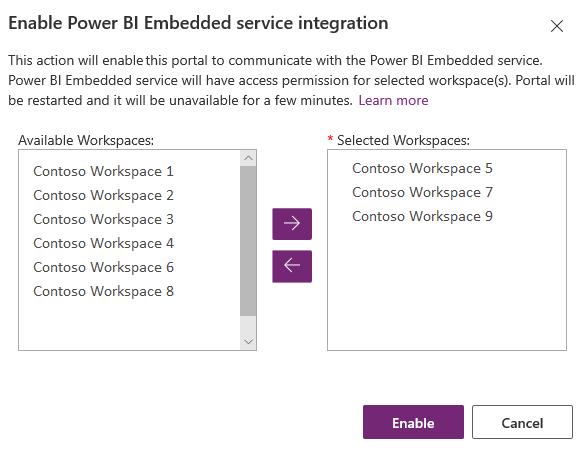 Select the name of the portal for which you want enable Power BI Embedded service, and then select Manage. 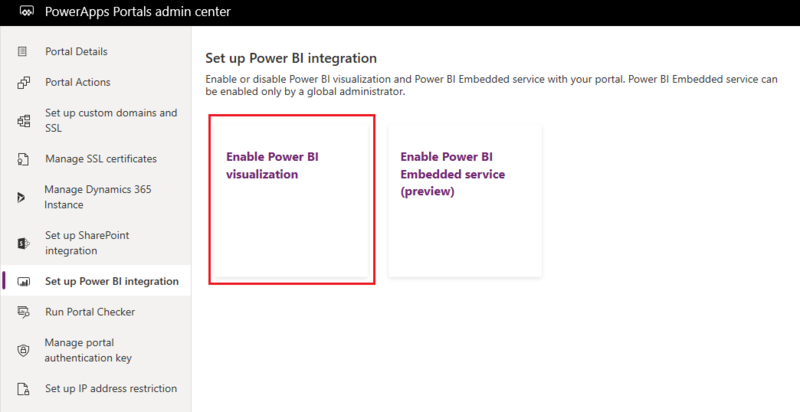 Go to Set up Power BI integration > Enable Power BI Embedded service (preview). In the Enable Power BI Embedded service integration window, select and move the Power BI workspaces from which dashboards and reports need to be displayed in your portal to the Selected workspaces list. After you add workspaces to the Selected workspaces list, the databases and reports are rendered after a few minutes. Copy the portal's application ID displayed in this window. Select Enable. While Power BI Embedded service is being enabled, the portal restarts and is unavailable for a few minutes. A message appears when Power BI Embedded service is enabled. You must now create a security group, and add it to your Power BI account. For more information, see Create security group and add to Power BI account. 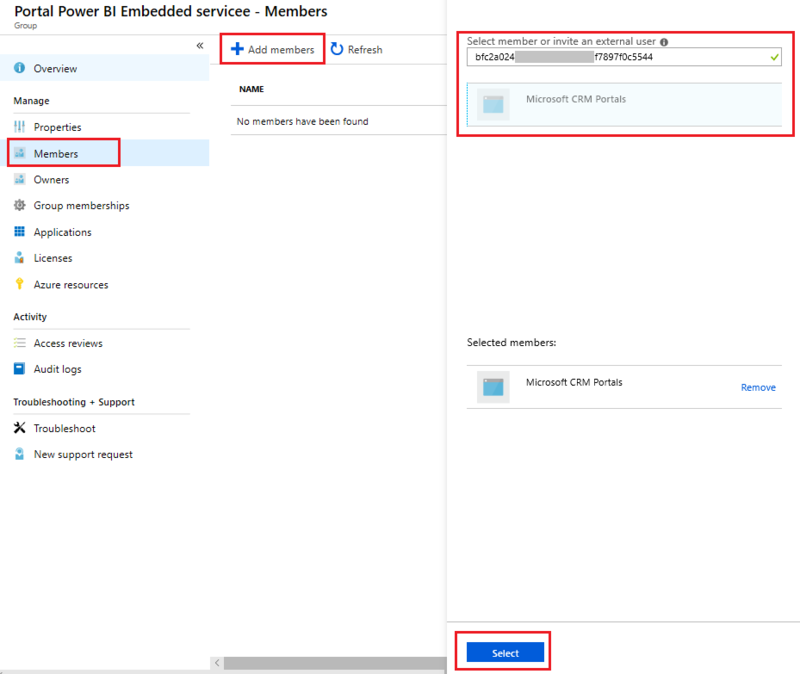 After enabling the Power BI Embedded service integration, you must create a security group in Azure Active Directory, add a member to it, and then add the security group in Power BI through the Power BI admin portal. This allows the dashboards and reports created in new Power BI workspaces to be displayed in the portal. You must sign in with the same Global administrator user that you used to enable the Power BI Embedded service. Group name: Portal Power BI Embedded service. Group description: This security group is used for Portal and Power BI Embedded service integration. Prerequisite: Before adding a member to the security group, you must have the portal's application ID with you. The application ID is displayed while enabling Power BI Embedded service integration. From the Groups - All groups page, search for the Portal Power BI Embedded service group, and select it. From the Portal Power BI Embedded service Overview page, select Members from the Manage area. Select Add members, and enter the portal's application ID in the text box. Select the member from the search result, and then choose Select. Sign in to Power BI using a Global administrator account for the directory. Select Settings in the top right of the Power BI service, and choose Admin portal. Under the Developer settings section, select Allow service principals to use Power BI APIs. 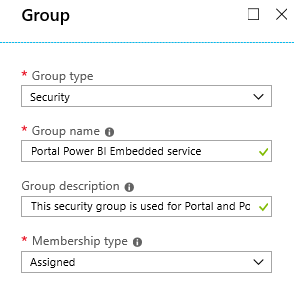 In the Specific security groups field, search for the Portal Power BI Embedded service group, and select it. Customizers can now use the powerbi Liquid tag to embed Power BI dashboards and reports from new Power BI workspaces on webpages in a portal. 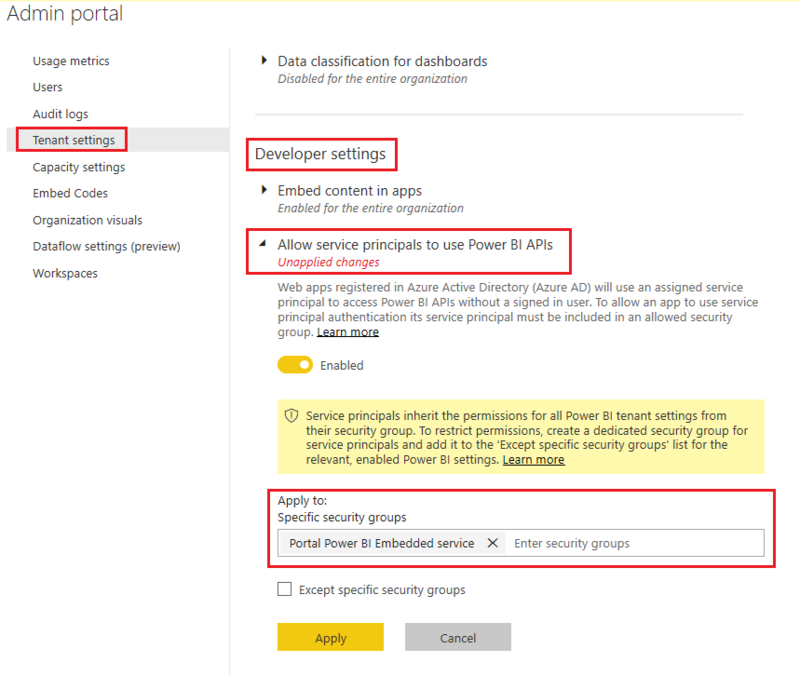 To use Power BI Embedded service, the authentication type must be specified as powerbiembedded. While embedding the Power BI content, customizers can use filter parameters to create personalized views. More information: powerbi Liquid tag. Select the name of the portal for which you want update or disable Power BI Embedded service, and then select Manage. 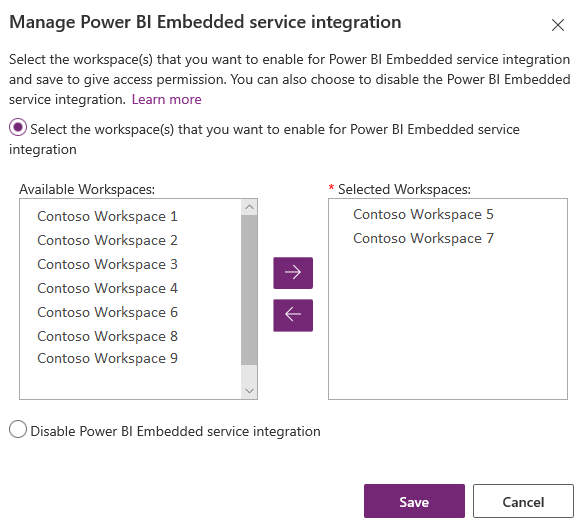 Go to Set up Power BI integration > Manage Power BI Embedded service (preview). In the Manage Power BI Embedded service integration window, remove or move the Power BI workspaces from which dashboards and reports need to be displayed in your portal to the Selected Workspaces list. After removing the workspaces from the Selected Workspaces list, it can take up to 1 hour to reflect the changes. Until then, the databases and reports are rendered on the portal without any issues. Select the name of the portal for which you want to disable the Power BI Embedded service, and then select Manage. 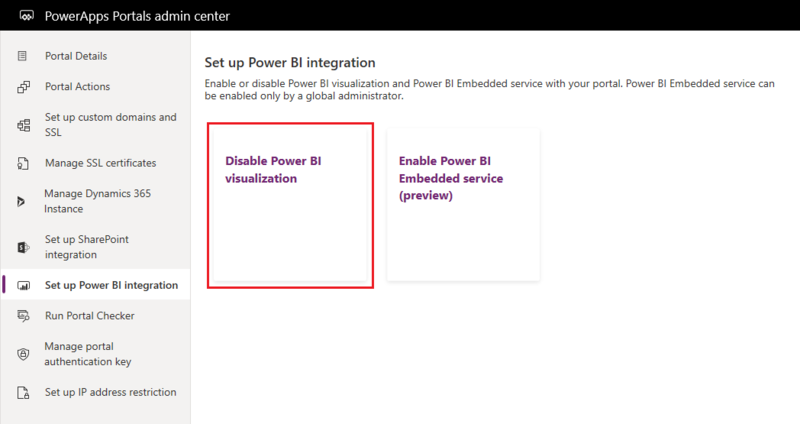 In the Manage Power BI Embedded service integration window, select Disable Power BI Embedded service integration. Select OK in the confirmation message. While Power BI Embedded service is being disabled, the portal restarts and is unavailable for a few minutes. A message appears when Power BI Embedded service is disabled.